Engelbart's law is the observation that the intrinsic rate of human performance is exponential. The law is named after Douglas Engelbart, whose work in augmenting human performance was explicitly based on the realization that although we make use of technology, the ability to improve on improvements (Bootstrapping, "getting better at getting better") resides entirely within the human sphere. Engelbart's Bootstrapping concept identifies the general, and particular, meaning of the observation with regards to rate and performance: a quantity, amount, or degree of something measured per unit of something else. That is, Engelbart's law is not limited to an increase in the acquisition, or use of, or quantity of knowledge, nor of the extent or depth of participation among individuals or teams, nor of the period-to-period change. The law is independent of the domain of performance and the quantity, amount, or degree on which one chooses a measure. Humans have long performed at exponential levels, and in widely varying contexts and domains. As with other phenomenon, when we notice similar results when applying a reagent or catalyst across many contexts and domains, we associate the power to produce or induce those results with the reagent, here the human animal. Stephen Jay Kline presented an interesting visualization of this exponential phenomenon in his 1995 book. See page 173, figure 14-1. The Growth of Human Powers Over the Past 100,000 Years Plotted as Technoextension Factors (TEFs). The log-log chart (time, TEF) illustrates exponential performance extending over many domains and over hundreds of years. On this topic Kline's work made heavy use of the work of John H. Lienhard. Kline specifically references Linehard's The Rate of Technological Improvement before and after the 1830s. Lienhard explored this topic several times at Engines of Our Ingenuity. See specifically Double in a Lifetime. Other relevant episodes include Influence of War, and Influence of War, Updated . In these latter two references Linehard explores, and discards, the influence of an urgent necessity as a necessary driver to such performance. In discussing the exponential nature of Moore's law , Gordon Moore locates the roots of his inspiration in Engelbart's observations on the propensity of humans to envision and achieve scale, and its non-linear effects. Engelbart labeled Collective IQ as the measure of how well people can work on important problems and opportunities collectively. It is, ultimately, a measure of effectiveness. It has long been the fashion to talk of human performance as if it were dependent on a particular socio-technology fabric. Yet Engelbart felt that what was important was not the particulars of that fabric, but its nature. He called the nature of that fabric The Bootstrap Paradigm . Central to his realization was a Dynamic Knowledge Repository (DKR) capable of enabling the concurrent development, integration and application of knowledge (CoDIAK). Such a DKR would itself be subject to the CoDIAK process. This is a co-evolution of the human system and the tool system. To facilitate this, Engelbart observed that a particular structure of human activities is most useful and natural, the A-level ('Business as Usual'), B-level ('Improving how we do that') and C-level ('Improving how we improve') Activities. In ABC Model, and particularly Turbo Charge the C Activity and Extra Bootstrapping Engelbart addresses the necessity of the C-level Activitiy in the shift from an incremental improvement curve to an exponential improvement curve. Whereas B-level Activities achieve mildly-exponential results, Engelbart held that C-levels Activities are necessary to achieve Bootstrapping, improving the improvement, a direct dependence on the intrinsically exponential nature of humans. Although Engelbart never published a metric for measuring Bootstrap effects, the Bootstrap Alliance, in 1997, considered, the characteristics of candidate metrics.
) There is insufficiently-explicit accounting of improvements to CoDIAK dynamics, and no accounting of C-level Activities. Although powerful, Engelbart's Bootstrapping effects are also unaccounted in simple exponential power formulations. ), it too provides insuffienct accounting of other activities. Comparing these two insufficient candidates illustrates the same key aspect underpinning Engelbart's law: human organization and directed activity are the essential elements to our performance. An implication of the foregoing as insufficient Bootstrapping metrics is that simple exponential power relationships are insufficient to improve CoDIAK abilities. By definition this result precludes a simple combination of such metrics or laws, such as a factor or power relationship between Moore's law and Metcalfe's law (or variations thereon). Various complex power functions, incorporating the effect of efforts at each of the ABC-level Activities were considered as candidates. The differences illustrate the interplay and interdependencies of A-level, B-level and C-level Activities, and the Bootstrapping effects (improved improvement). In all three, improvement to CIQ, CoDIAK, and Bootstrapping itself depends on a recursive application of B-level Activities and C-level Activities. Although levels of exponential rates of performance, over many time periods and in many domains, with respect to quantity, extent, or degree, is well-documented by Lienhard and many others, modern and real-time ongoing of Bootstrapping levels of performance remain difficult to find. In explicitly placing within the human sphere the locus of ability for improving our improvement, Engelbart's law chides us against choosing anemic measures of change in performance. Linear rates, or simple compound rates fall far short of our intrinsic abilities. In addition to envisioning the Bootstrap Paradigm, describing the nature of a suitable socio-technical fabric, Engelbart envisioned its particular characteristics, which, when placed into use, and subjected to improvement upon improvement, would meet human requirements. Engelbart, in writing and working, intended to apply this method of working to all domains of human endeavor, from the individual to the whole species, in private or public service[attribution needed]. ^ Merriam-Webster's Collegiate Dictionary. Merriam-Webster. 1999. ISBN 978-0877797135. ^ Kline, Stephen Jay (1995). Conceptual Foundations for Multidisplinary Thinking. ISBN 9780804724098. ^ John H., Lienhard (1979). "The Rate of Technological Improvement before and after the 1830s". Technology and Culture. Johns Hopkins Press. 20 (3): 515–530. doi:10.2307/3103814. JSTOR 3103814. ^ Lienhard. "Engines of Our Ingenuity". Retrieved July 10, 2013. ^ Lienhard. "Double in a Lifetime". Retrieved July 10, 2013. ^ Lienhard. "Influence of War". Retrieved July 10, 2013. ^ Lienhard. "Influence of War, Updated". Retrieved 2013-07-10. ^ John Markoff (2005-04-18). "It's Moore's Law, but Another Had the Idea First". The New York Times. Retrieved July 10, 2013. ^ Engelbart. "The Bootstrap Paradigm". Retrieved July 10, 2013. ^ Engelbart. 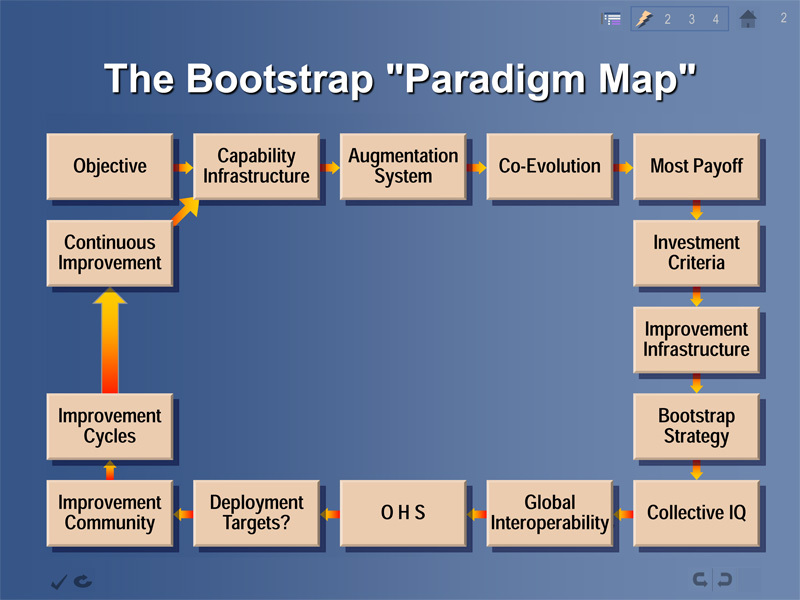 "The Bootstrap Paradigm Map". Retrieved July 10, 2013. ^ Christina Engelbart. "About Dynamic Knowledge Repositories – an introduction". Retrieved July 10, 2013. ^ Engelbart. "ABC Model for Continuous Improvement". Retrieved July 10, 2013. ^ Nick Ragouzis. "Positioning the Bootstrap Alliance" (PDF). Retrieved July 10, 2013.